Admiral Barry Kennedy Atkins, USN (Ret. ), 94, of Richmond, Virginia, died Tuesday, November 15, 2005.
responsible for the sinking of the Japanese battleship Fusco. Admiral Atkins was related through his mother’s family to the Griswolds of Old Lyme. The family spent most summers in Connecticut, and Mr. Atkins always said that he considered Old Lyme home. He is survived by two daughters, Sue-Sheila Strong Keener of Richmond, Virginia, and Lynne Strong Agee and her husband, Tim, of Brushcreek, Tennessee; two sons, Norman Atkins of Falls Church, Virginia, and Ian K. Atkins of Coquille Oregon; three granddaughters, Courtney Keener of Richmond, Virginia., Amber Atkins of San Diego, California, and Julie Agee of Bushcreek, Tennessee; a grandson, Chris Agee; and three great-granddaughters, Alexis Agee, Anabelle Grace Agee, and Lily Laree Agee. Admiral Atkins was predeceased by his wife, Muriel S. Atkins; a brother, Griswold Atkins; and a sister, Janet A.Folk. Funeral services will be held in Richmond, Va., on Nov. 17, followed with interment in Arlington National Cemetery on 30 January 2006. RICHMOND, Virginia -- Retired Admiral Barry K. Atkins, who was at the command when his destroyer sunk a Japanese battleship in a historic World War II battle, died Tuesday, his family said. He was 94. Atkins, a 1932 Naval Academy graduate who retired from the Navy in October 1959, received the Navy Cross for "extraordinary heroism" as commanding officer of the USS Melvin during the Battle of Surigao Strait in the Philippines. Military historians believe the sinking of the Japanese Fuso was the only instance in the war of a destroyer sinking a battleship. On October 25, 1944, a torpedo fired by the Melvin hit the Fuso broadside, triggering a series of explosions that ultimately sunk the Fuso. The Melvin's crewmen have been waging an effort to have a ship named in honor of their former commander. "They are like a Band of Brothers that went through so much together and the events created a bond and connection that none of us can ever understand," Atkins' daughter, Sue Keener, wrote of the Melvin's crewman in an e-mail sent to The Associated Press for a story on that effort. In addition to the Melvin, Atkins served tours of duty on the USS Parrott, USS Tennessee and USS New Mexico, among others, and received the Silver Star, Bronze Star and many other ribbons and commendations. Atkins is survived by four children. Services with full military honors will be held January 30, 2006, at Arlington National Cemetery. 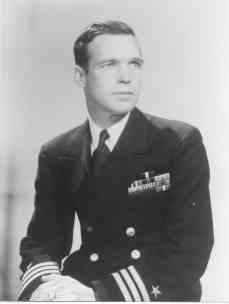 Barry K. Atkins graduated from the U. S. Naval Academy in the class of 1932. He served in the battleships TENNESSEE ( BB 43 ) and NEW MEXICO ( BB 40 ) before commissioning the USS MAHAN ( DD 364 ) in 1936. Two years later he reported to USS CUYAMA ( AO 3 ) for a one year tour in the "beef boat navy" prior to spending two years in the Executive Department of the Naval Academy. On 31 July 1941, Lieutenant Atkins reported to the USS PARROTT ( DD 218) then in overhaul at the Navy Yard, Cavite, Philippine Islands. PARROTT was a flush deck, four stack destroyer commissioned in May 1920 and had served in the Asiatic Fleet since 1925. As third officer, Lieutenant Atkins was assigned duty as Gunnery Officer with collateral duty as Commissary Officer. For the next 13 months Lieutenant Atkins' story would be the story of PARROTT. Upon completion of overhaul in October, the ship resumed training and took up off shore sound patrol picket duty at the entrance of Manila Bay. Late in November Aamiral Thomas C. Hart, CinC Asiatic Fleet, dispersed his forces, sending DesDiv 58, with PARROTT to Tarakan, Borneo. When the war began on 8 December 1941, Borneo time, PARROTT was as ready as possible, considering her age. She became part of the desperate effort of the ABDA Force ( American, British, Dutch, Australian ) to hold the Malay Barrier - the Netherlands East Indies - against overwhelming odds. After dark on 23 January 1942, PARROTT with three other four stackers was underway enroute to attack a Japanese invasion force landing troops at Balikpapan, Borneo. The enemy force of 16 transports was guarded by 2 light cruisers, 12 modern destroyers and other patrol craft. Beginning at 0230 on the 24th the American destroyers ranged up and down the enemy transport formation, firing torpedoes then opening fire with their 4"/50 caliber main batteries. Taken by surprise, and apparently believing they were under attack by submarines, the enemy failed to take the destroyers under fire. By 0400, the Americans had completed their mission and were heading out of the area at 28 knots. PARROTT had sunk one transport and assisted in the sinking of another. Altogether four transports and one Patrol Craft were sunk and many other ships were set on fire. This action, which became known as the Battle of Makassar Straits, was the first and only allied victory of the early days of the war. At the end of January, the CO of PARROTT fleeted up to command of DesDiv 59, the Executive Officer assumed command and LT Atkins became XO and navigator. In mid February the ABDA Force came under command of a Netherlands Navy VADM. The ships were operating without air cover, poor intelligence, almost out of ammunition and nearly all of the ships were in desperate need of repair. They were outnumbered, out gunned, and nearly out of everything else necessary to fight a powerful enemy. The help from the states that had been promised had not shown up and even accurate information about the Pearl Harbor attack was not available. During the night of 19-20 February, PARROTT was part of an allied force which attempted to destroy enemy transports and their escorts attacking the island of Bali. During her run into the area, PARROTT's rudder jammed and she briefly grounded, but was able to pull clear. Although most of the enemy ships had already departed, the allied force suffered substantial losses. On 1 March PARROTT was in the south Java port of Tjilatjap with other elements of what was left of the ABDA Force. With the enemy already landing on the northwestern tip of the island, all ships were ordered to clear port and proceed independently to safety in Australia. PARROTT reached Fremantle safely but several of the other ships that left port with her were not so lucky. Five of the destroyers of her squadron and many other ships had been lost during those terrible first three months of the war, but the enemy's advance had been stopped and the U. S. had gained valuable time to rebuild her forces. PARROTT departed Fremantle in May 1942 enroute to the states. While in Hawaii, Lieutenant Atkins was promoted to Lieutenant Commander and, in August he was transferred to the Motor Torpedoboat Training Station, Melville, Rhode Island. Following training there, Commander Atkins commissioned MTBRon 8 at the New York Naval Shipyard. His squadron was promptly loaded aboard merchant ships and transported to Australia. From there, the boats were brought to New Guinea. As senior Squadron Commander in the theater, he directed operations of other PT squadrons in the area and commanded advanced bases at Tufi and Morobe. He personally took part in more than 70 combat missions, receiving the Silver Star for "conspicuous gallantry and intrepidity in action". Returning to the U. S. in December 1943, he took charge of the PT Boat Shakedown Detail in Miami, Florida. In July 1944, having been promoted to Commander, he went back to sea and in the Philippines on 10 October, he assumed command of USS MELVIN ( DD 680 ). Just over two weeks later he took MELVIN into action at the Battle of Surigao, Strait. His ship was credited with sinking the enemy battleship FUSO.... the only US destroyer to accomplish such a feat. For this action, Commander Atkins was awarded the Navy Cross "For extraordinary heroism... in action against major units of the enemy Japanese Fleet .... which contributed materially to the decisive defeat of enemy forces". MELVIN later operated with fast carrier forces attacking the Japanese home islands and supporting the Okinawa campaign. She also participated in the last surface action of the war, a sweep through the Kuriles and bombardment of Paramashiro Wan just days before the war ended. Awarded the Bronze Star, his citation reads, in part, "For heroic achievement, as Commanding Officer .... in action against enemy Japanese forces in the Kyushu and Okinawa area from 14 March to 14 May 1945. Going to the aid of a badly damaged destroyer on 29 April 1945, Commander Atkins displayed excellent seamanship by maneuvering his ship alongside the stricken vessel in the face of burning and exploding ammunition to fight the fires and, after they were extinguished, remained alongside to provide electrical power and water to enable the ship to regain power ........."
MELVIN returned to the states after the war for decommissioning and Commander Atkins was detached and reported to the Commandant 8th Naval District as Prospective Commanding Officer HOLDER, placing her in commission on 18 May 1946. The Navy could not have found, nor could the crew of HOLDER have asked for a better skipper. He was a great teacher, but woe be unto the slacker or anyone not interested in learning. Without doubt, he was the finest shiphandler with whom most of the officers and crew ever served. Post Script: After being detached from HOLDER in August 1947, Commander Atkins served on the United Nations Military Staff Committee. In March 1950, he attended Fleet Sonar School in Key West, then reported to ComCarDiv 16 and ComLantFIt Hunter Killer Task Force 81 as Surface Operations Officer and Staff Navigator. In March 1951, then Captain Atkins became Chief of Staff to the newly formed Carrier Division 14. From December 1952 until July 1955, he served on the staff of Commander in Chief, U. S. Naval Forces, Eastern Atlantic and Mediterranean in London. Next he took command of the USS WINSTON ( AKA 94 ) in Yokosuka, Japan. In August 1956, he fleeted up to command Transport Division 32 and in April 1957, he took command of Amphibious Squadron 3, doubling as Commander Amphibious Group, Western Pacific. After conducting a major joint operation with Republic of Korea Marines, Captain Atkins received a letter of commendation from the CNO, Republic of Korea. In January 1958, CAPT Atkins returned to Annapolis, Maryland, assuming command of the Naval Station with collateral duty as Chief of Staff to the Superintendent of the Naval Academy. Upon his own request he was transferred to the Retired List as Rear Admiral on 1 November 1959, after twenty seven years of honorable service as a commissioned officer of the United States Navy. Rear Admiral Atkins now lives in Fredericksburg, Virginia with his wife, the former Muriel Strong. He is an active member of the HOLDER and MELVIN Associations as well as numerous other professional organizations.